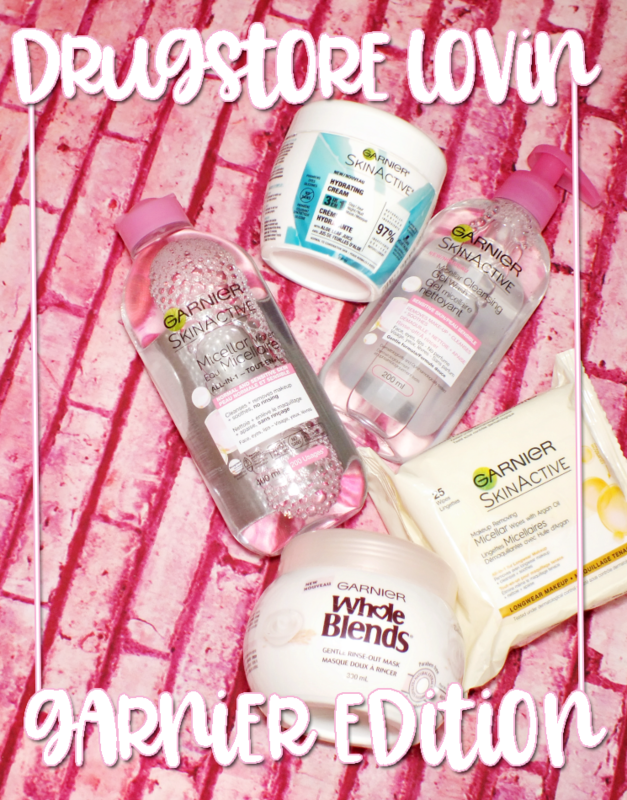 A very Canadian post today, with a gorgeous little polish collection from Ceramic Glaze. 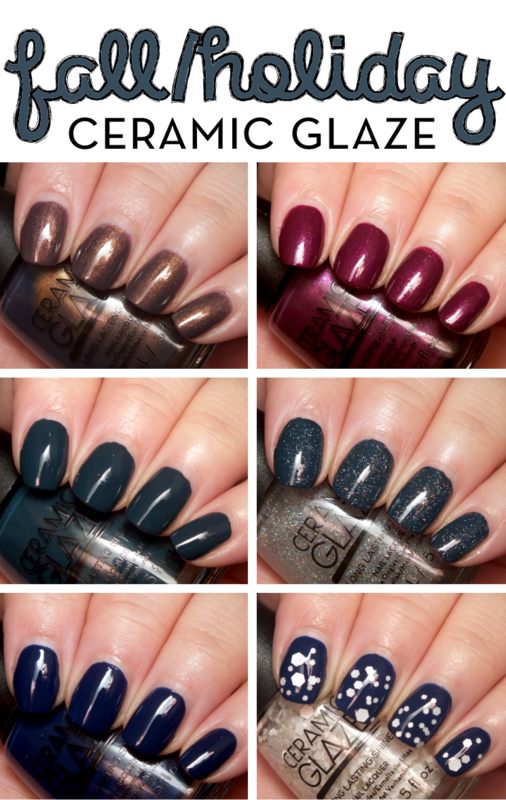 I think this will likely be the last polish collection of 2015 too. 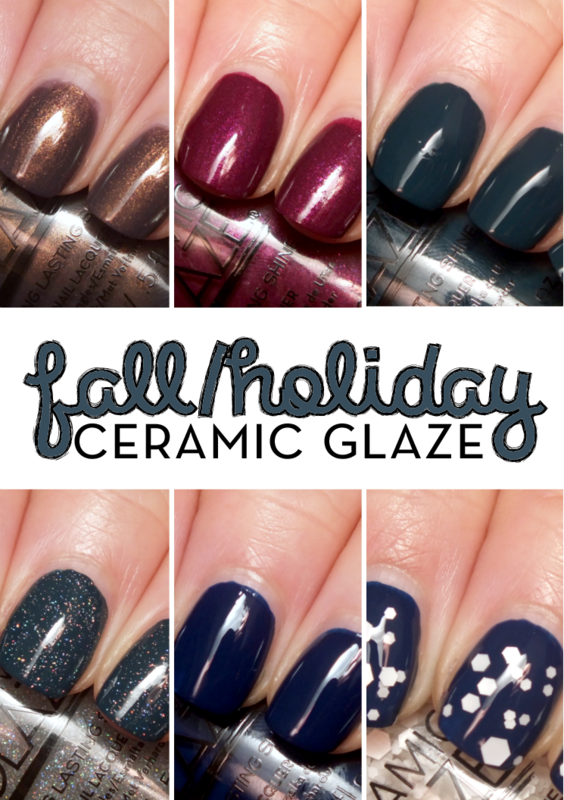 It's been a pretty good polish year, and the Ceramic Glaze Fall/Holiday Collection wraps things up nicely. If you're not Canadian and are thinking "I've never heard of Ceramic Glaze... Have I?" it's because Ceramic Glaze is exclusive to Shoppers Drug Mart our (aka Canada's) national drugstore. Now, onto the polish! Wonderland is a is an interesting shade that shifts from an antique gold meets lavender-taupe to an antique gold meets olive green shade depending on the light. 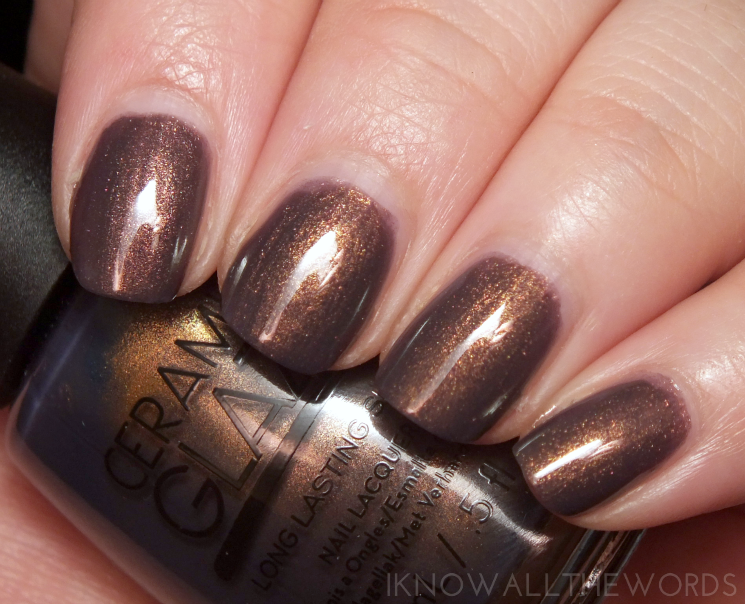 The polish has an irridescent shimmer and inner glow that adds to duochrome type effect. The formula is quite thin on the first coat, yet builds quite well with the second, but does need a third for full depth of colour. 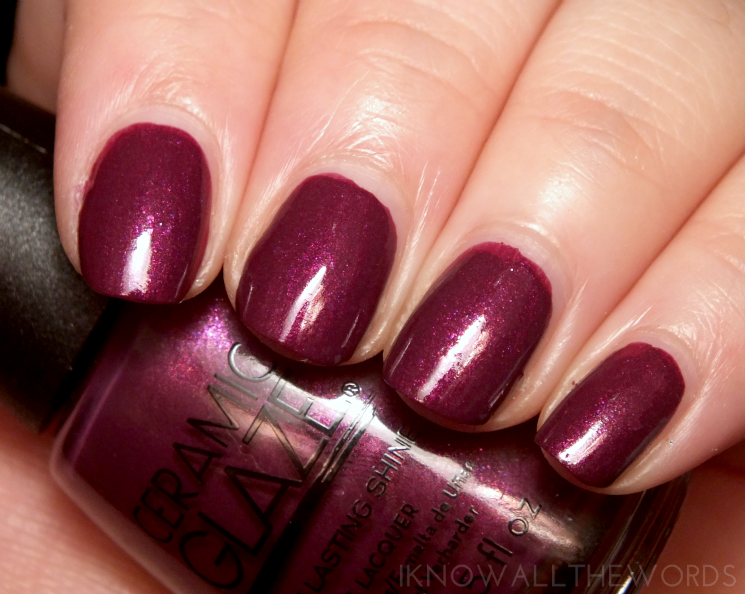 Applause is a plummy burgundy shade with inner shimmer. It's not totally unique, but quite pretty. 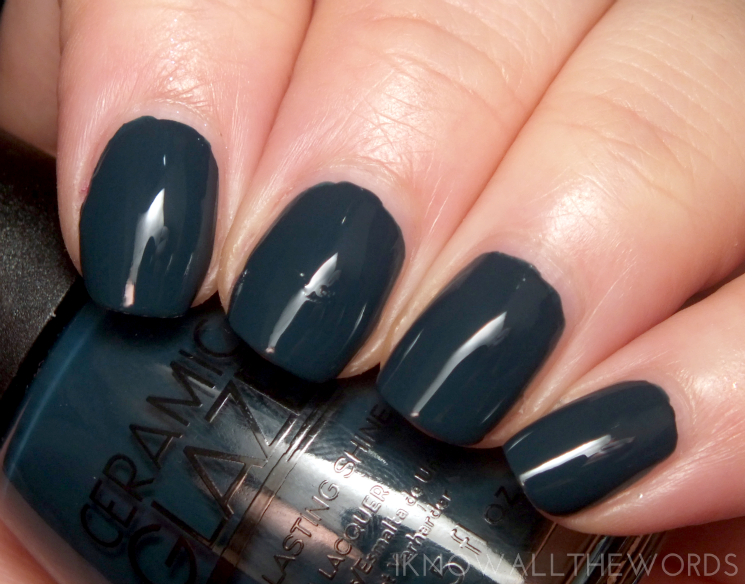 The formula is easy going, but does need three coats for full depth and opacity. 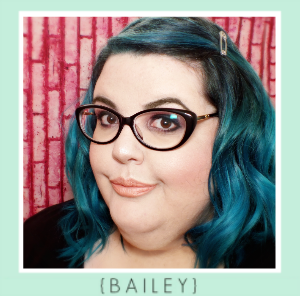 Sorcery is a deep, teal kissed forest green cream. 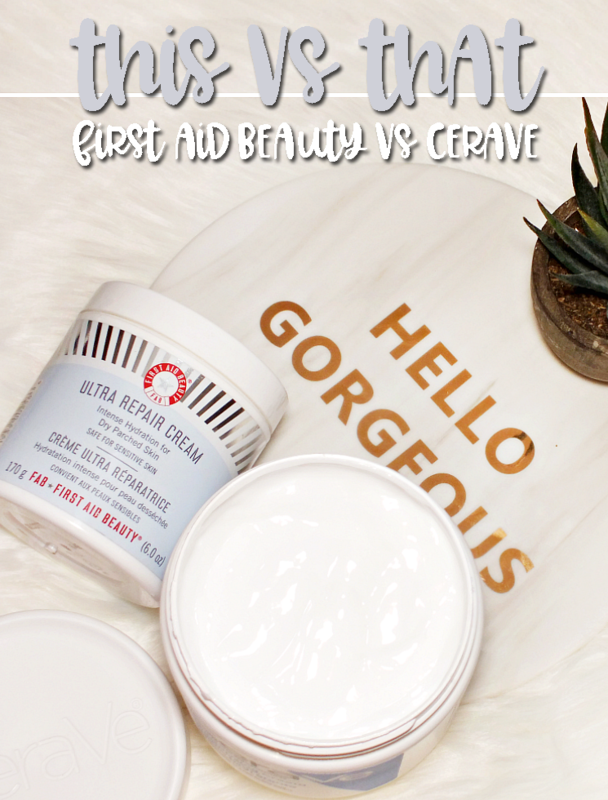 It's simple, but stunning with an amazing formula. It's super opaque and almost a one coater. I used two, but with careful application you can get away with one. 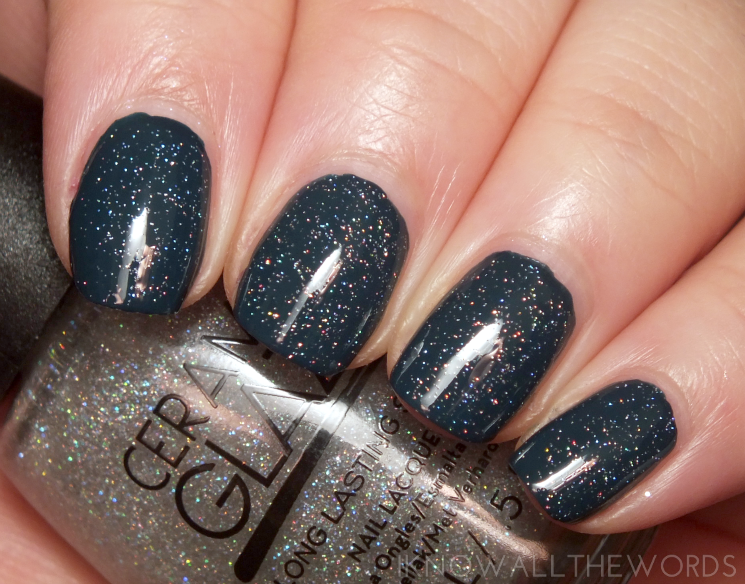 Diamond Dust is a super sparkly holographic glitter topper. 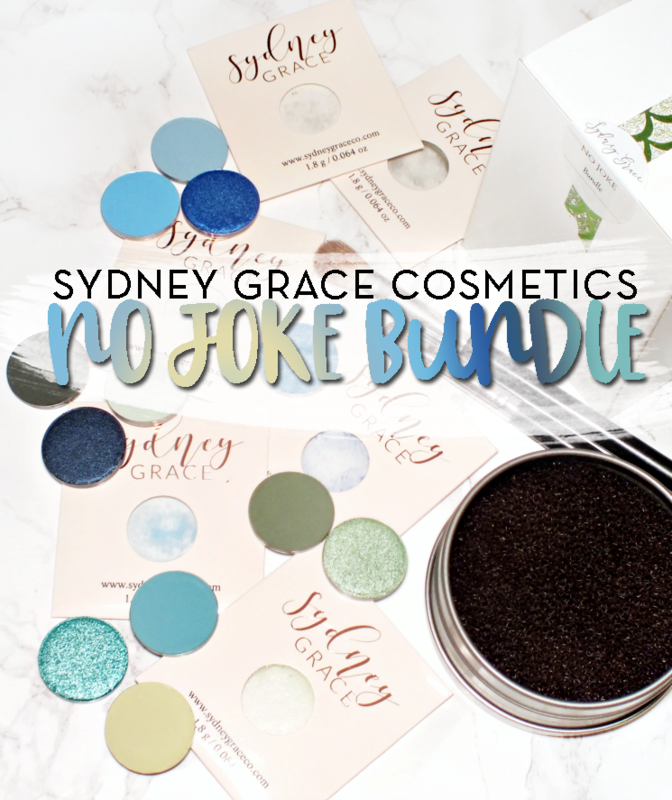 The coverage is perfect, as the glitter isn't too intense and doesn't alter your base shade. The glitter is very smooth when dry and keeps it's glossy finish. 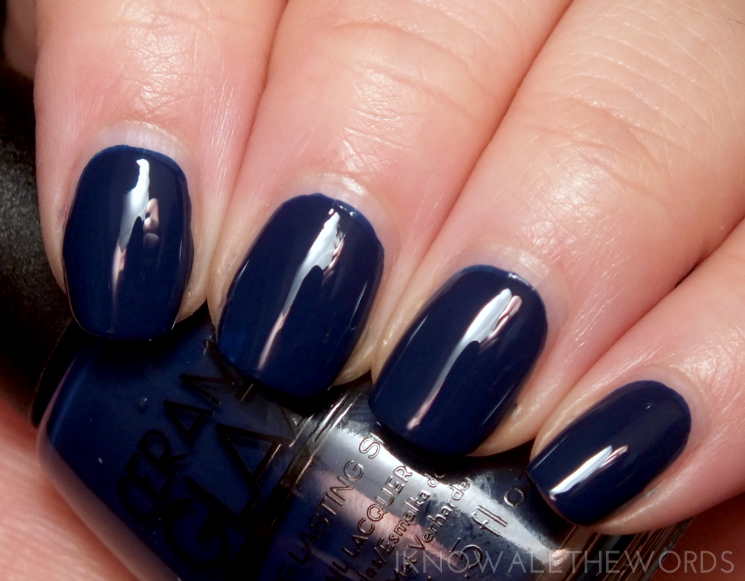 Regal is a deep royal-navy cream. 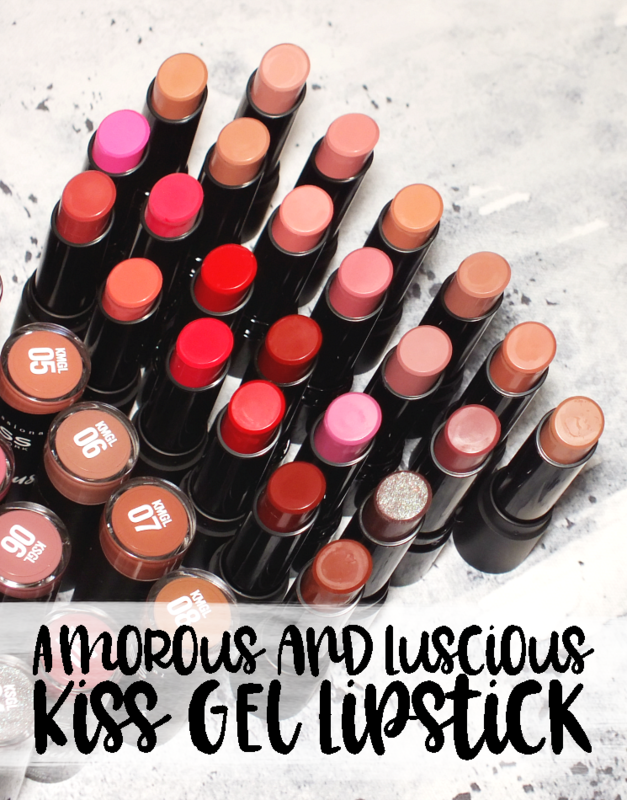 The formula is amazing, as it's super pigmented and smooth with the glossiest finish. Much like Sorcery, it's almost a one coater. Two coats. 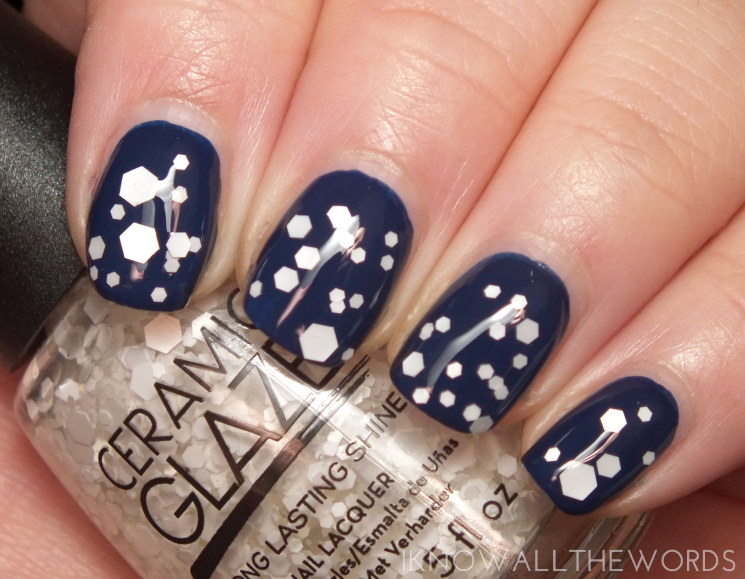 Snow Queen is a glitter/ confetti topper that features small, medium, and large hex shaped bits in a clear base. There could be more glitter to base, but the dabbing method helps get the pieces on the nail. I found I had to fish around for the larger pieces, but that's pretty common with this type of polish. Overall, I really like these shades. 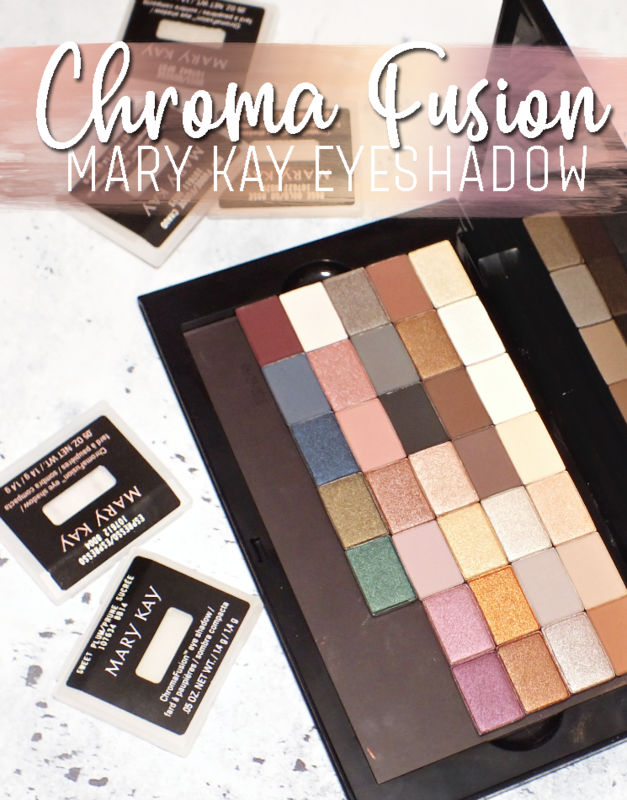 While they're not totally groundbreaking for a holiday collection, the formulas and finishes are exceptional and just look so great on the nail. What do you think? 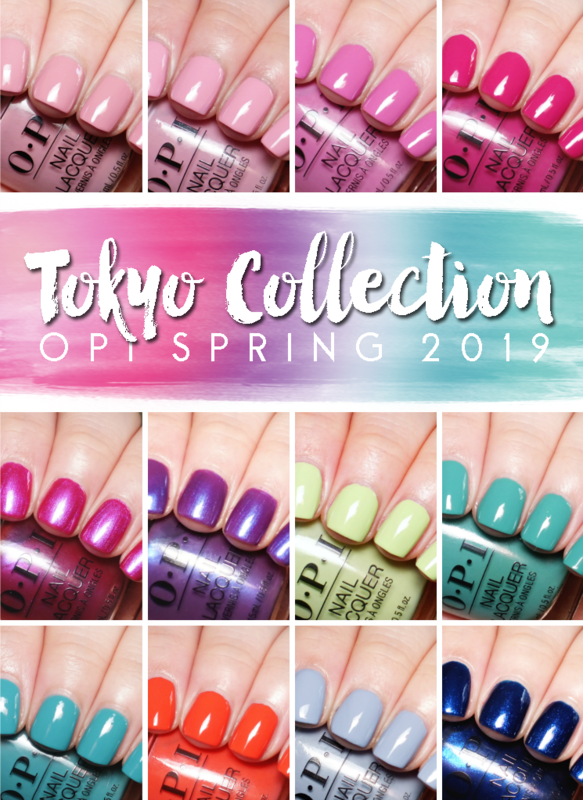 are you feeling any of these polishes?